After the Paris Agreement, the EU committed to cut greenhouse gas emissions by 40% by 2030 compared to 1990 levels. This reduction includes 43% decrease in ETS sectors, and 30% in non-ETS sectors such as agriculture, buildings and transport. In addition, on 17 May 2018, the European Commission proposed CO2 emission standards for new heavy-duty vehicles in the EU. In Europe, Heavy-Duty vehicles represent around 5% of all vehicles and still contribute about one fifth of the total CO2 emissions within the road transport sector. Plug-in hybrid electric vehicle (PHEV) is a promising technology to reduce tailpipe and fuel consumption. However, compared with non-plugin HEVs, extra investments are required in terms of battery size and charging infrastructure. Finding the balance between reducing operational and hardware cost is a major challenge for the vehicle manufacturers. Therefore, in the ORCA project special focus is given to the Total Cost of Ownership (TCO) and Life Cycle Assessment (LCA) Optimisation Framework for heavy-duty vehicles. To achieve its ambitious goals and to share know-how within partners, the ORCA consortium organizes annual Internal Workshops. 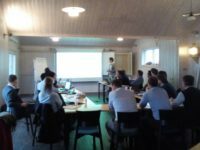 On 30th October 2018, the ORCA consortium came together at Volvo’s premises in Gothenburg, Sweden for the 2nd Internal ORCA Workshop. The participants of the workshop represented the entire ORCA consortium. In the half day long workshop the first two presentations aimed at giving insight to the two co-design methodologies for the Volvo and IVECO use cases, discuss the approaches, find synergies, align and improve both co-design methodologies. The third part of the workshop focused on an user-friendly automated tool developed by TNO regarding the energy management strategy.